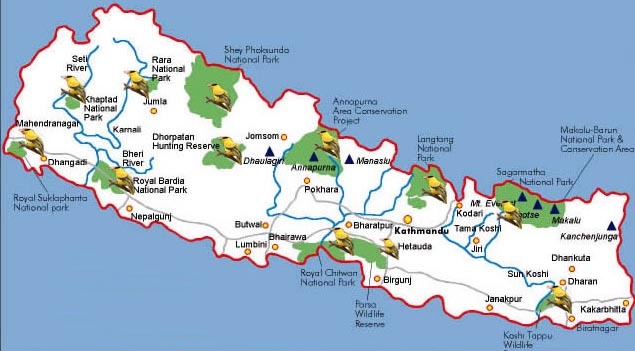 The approach follows the "Everest Base Camp and Gokyo lakes" itinerary, one of Nepal's most famous treks, through the Khumbu Mountains - Sherpa country. After a magnificent mountain flight to Lukla we follow the Dudh Koshi valley to Namche Bazaar. The trail to Gokyo is a gradual ascent up the valley passing through patches of birch and rhododendron forest where the elusive musk deer can sometimes be seen. Through small yak-grazing settlements we reach the Gokyo lakes where we climb Gokyo Peak (5480 m) and enjoy stunning summit mountain scenery that includes Everest, Makalu and Cho Oyo. After the Cho La pass, we reach Gorak Shep and climb to Kala Patthar (5545 m) and enjoy an impressive up-close view of Everest. 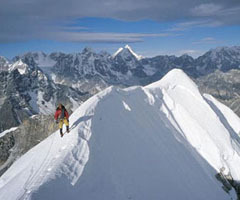 The ascent of Island Peak includes little technical climbing (Alpine Grade: PD). Only the last part, a steep (40 degrees) snow and ice ramp requires the use of fixed rope to reach the summit. The scenery is absolutely breath-taking: Lhotse, Makalu, Nuptse, Ama Dablam and Buruntse. Our return route passes through Tengboche, a magnificent location with a fascinating monastery, where we rest and savor the incredible scenery, including magnificent views of Everest, Ama Dablam (6856m), Kantega (6809m), Kwangde (6194m), Nuptse (7879m), and Lhotse (8511m), to name but a few. We climb the South Ridge, which involves grade 1 scrambling up a gully and easy rock to a glacier. We cross this, negotiating some crevasses to a final steep (40°) snow slope (100m) leading to the summit ridge. This can be corniced and leads in about three rope lengths to the summit. There are superb views of the south face of Lhotse, Baruntse and Ama Dablam. During the ascent of a trekking peak, the groups are accompanied only by a high mountain guide. We recommend booking a 2nd high mountain guide who will help during the ascent and bring back to the base camp those who are not able to reach the summit. Without the high altitude Sherpa, a whole group could be obliged to return to the base camp just because one of the members is not able to reach the summit. Day 03: Kathmandu - Lukla (2850 m) by plane. 3-hour walk to Phakding (2600 m). in 5h. A tough climb towards the Sherpa capital. Beautiful vistas of the Thamserku (6608 m), the Everest (8848 m) and the Lhotse (8511 m). en 4 h. Namche Bazaar visit in the morning. Many of the typical mani walls and prayer wheels are spread on the trail to Thame. in 4 h. Visit of the picturesque Thame monastery. Walk on the Bhote Koshi bank, the track is highly frequented by yak caravans coming down from Tibet and heading to the Namche market. in 4 h. Slope gently up through grassy areas. Camp beside the lake. Gokyo (4750 m) in 5 h. Magnificent panorama from the pass: Tengi Ragi Tau, Rolwaling Himal and the small Rermo Pokhari lake on west and Gyachung Kang, Everest, Lhotse, Makalu and the Gokyo lakes on east. Camp beside the lake. Day 09: Gokyo Peak ascent(5480 m) . in 5 h. Crossing through moraines of the terminal spit of Ngojumpa glacier. From Thagna, climb up through gentle and grassy slopes to the foot of the Cho La. Dzongla (4840 m) in 5 h. The steep trail goes through blocks of rocks. After the pass, we shortly cross an easy segment of the glacier then descend towards Dzongla. Gorak Shep (5100 m) in 6 h. Easy descent on mountainside to Lobuche, then climb up through moraines towards Gorak Shep. Day 13: Gorak Shep - Kala Patthar (5545 m) - Lobuche. Camp at 5200 m in 5 h. After the pass, we can enjoy splendid altitude lakes and a stunning belvedere of the Ama Dablam. Option to establish a lower campsite at 4750 m.
Day 15: Camp at 5200 m - Island Peak Base Camp (5120 m) in 5 h.
Chukung (4730 m) in 9 h. The trail makes a climb to a narrow edge, leading on to the glacier (5900 m). We rope-up now and wear our crampons as the real climb starts. We have a fair 150 m progression onto the crevassed glacier. A fixed rope is set up on a 45° slope, 130 m long, that leads onto the summit ridge, 100 m long. This ridge is wonderfully airy and soon the summit is gained. Standing on the top we have stunning close-up views of the south face of Lhoste (8501 m) looming over us. In the other direction, dramatic views of Ama Dablam, Chamlang, Baruntse. Descent is made by the same route, proceeding the whole way down to Base Camp, then to Chukung. in 7 h. The largest and most active monastery of Khumbu is located at Tengpoche. Day 18: Tengpoche - Phunki ( 3250 m) - Namche Bazaar (3440 m) in 5 h.
Day 19: Namche Bazaar - Lukla in 7 h.
Day 20: Lukla - Kathmandu by plane. Day 21: Kathmandu. Day at leisure. Safety day for your international flight. Day 22: Kathmandu. Hotel - airport transfer.